The TranzAlpine train. . . 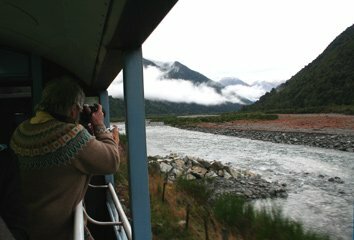 It's perhaps the most scenic train ride in New Zealand, and one of the most scenic train trips anywhere in the world. The TranzAlpine, run by New Zealand train operator KiwiRail as part of their Great Journeys of New Zealand division, runs once daily between Christchurch, Arthur's Pass and Greymouth on the South Island's west coast, through the amazing misty mountain scenery of the Southern Alps. 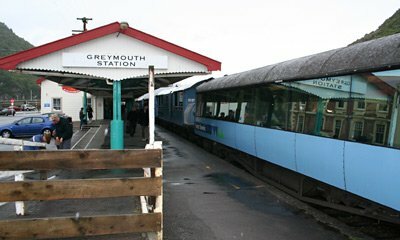 The journey takes 4½ hours, and if you like you can go there and back in a day with an hour in Greymouth. Or take the TranzAlpine one-way, and connect with buses down the west coast to Franz Josef Glacier. Although I rate the North Island's Northern Explorer from Auckland to Wellington as a far more historic and epic route, and in many ways almost equally scenic, you certainly won't regret buying a ticket for the TranzAlpine! This page explains the TranzAlpine's timetable, fares, how to buy the cheapest tickets, and what there is to see on the journey. What's it like on board? 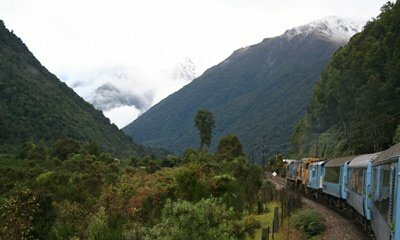 The TranzAlpine is the most successful of all of Kiwi Rail's passenger trains, it's very popular with tour groups because of the spectacular scenery through the Southern Alps between Christchurch and the South Island's west coast at Greymouth. 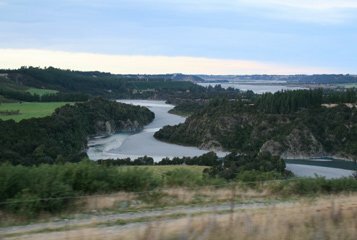 The Man in Seat 61 says: "It's a fantastic trip that easily lives up to its reputation, but in many ways the TranzAlpine is not as epic or historic as the Auckland-Wellington Northern Explorer, which remains my personal favourite NZ train ride." 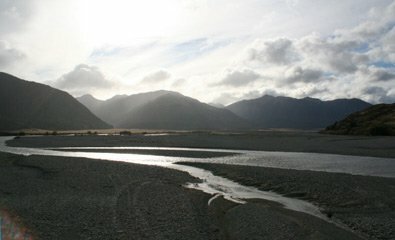 The TranzAlpine runs daily. One-class seating, cafe-bar & open air viewing platform. The journey is 223.8km. * Starter fare = limited availability, no refunds, changeable until 24 hours before departure if you pay any difference in fare.
. 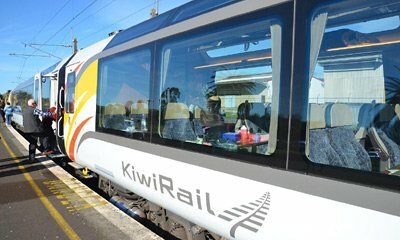 These cheap fares disappear from the Kiwi Rail Great Journeys website when it is viewed from a computer outside NZ, so either book by phone from the Christchurch i-SITE visitor centre on +64 3 379 9629 or use the Tor Browser workaround explained below to buy these fares online. Children aged 2-14 travel at reduced fare, Infants under 2 travel free. New Zealand railpass information. 2. 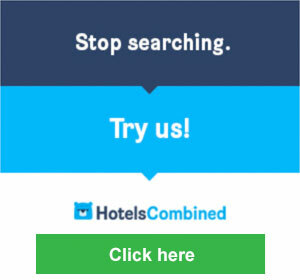 What you see if you book with the Hola! extension installed & switched to 'New Zealand', as explained below: Much cheaper prices magically appear! (1) Go to http://hola.org and install the Hola! extension for Google's Chrome browser (obviously, if you don't already use Chrome on your PC, install it first, it's a great browser). Hola! is a browser extension which allows you to surf using an IP address located in a country of your choice. I use Hola! to watch BBC iPlayer catch-up TV on my laptop when I'm in the Netherlands at my in-laws, as the BBC annoyingly blocks iPlayer when a computer is located outside the UK. (2) Open your Chrome browser, and you should now see the Hola! flaming head logo top right. If it says 'off', switch it on. Click it and it should say 'Select A Country'. Click 'More...', then look down the list and pick 'New Zealand'. It should briefly say 'Browsing from New Zealand' and then a New Zealand flag should appear top right in place of the Hola! logo. You are now browsing with an NZ IP address! (3) Now go to www.greatjourneysofnz.co.nz and book your KiwiRail Great Journey, and be amazed at how cheaper prices magically appear that weren't there when you browsed normally! (4) I recommend removing or at least disabling Hola when you've finished with it. I find it useful, but left running it has some computer vulnerabilities. Or buy via an international phone call instead: If you're not sufficiently computer-savvy, you can buy all the cheap prices if you call New Zealand. 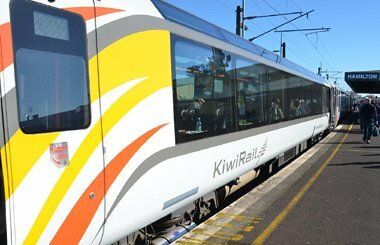 Call KiwiRail Great Journeys telesales on + 64 4 495 0775, as all fares are available by phone, potentially saving money even allowing for the cost the call. 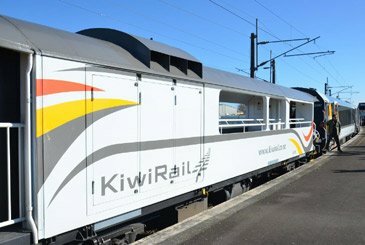 From outside New Zealand, call KiwiRail's Great Journeys of New Zealand passenger division on + 64 4 495 0775, remembering that NZ is 13 hours ahead of the UK in the UK's winter, 11 hours in summer - you should be able to buy the full range of fares including Starter. When you're in NZ, call them on their free-phone number, 0800 TRAINS (0800 872 467). Alternatively, if you live in the UK or Ireland you can arrange New Zealand train tickets or passes & reservations with International Rail, call 0844 248 248 3. From outside the UK +44 844 248 248 3. Lines open 09:00-17:00 Monday-Friday. 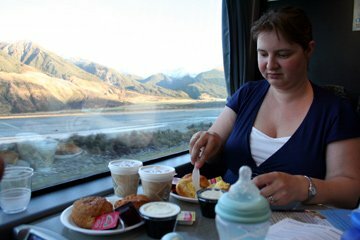 What's it like on board the TranzAlpine? New carriages now in service! Reclining seats, most facing direction of travel, all lining up with huge panoramic windows - note the roof skylights too!. There's loads of legroom even if you're over six feet tall. Seats recline to about 40 degrees. Seats are not allocated at booking, but by the train manager before departure. However, if you book by phone (or book online then call Kiwi Rail's freephone number when you get to NZ quoting your booking reference) you can make a seating request. Seats on the right-hand side of the train going to Greymouth probably get the best views, or the left-hand side returning to Christchurch. Four friends or family travelling together could request one of the few bays of 4 seats facing each other around a table, keen photographers might want to request a seat close to the open-air viewing car. Requests can't be guaranteed, but it doesn't hurt to ask! All your heavy baggage is checked in to the baggage van, only hand luggage may be taken into the seating coaches. New Premium class... At some point, a new Premium class carriage will be added to the TranzAlpine, with extra-legroom extra-width reclining seats arranged 2+1 across the car width (the usual cars have seats 2+2 across the car). Details will follow when known. 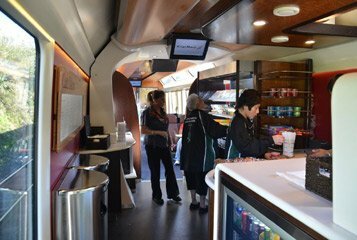 Cafe-bar: In the centre of the train is a counter selling tea, coffee, wine, beer, spirits, snacks & light microwaveable meals at reasonable prices. I can recommend a cream tea in the afternoon, and a glass of Montana Sauvignon Blanc! You take your food & drink back to your seat. Bring cash if possible as cards are sometimes not accepted if the credit card machine is out of cellphone range. 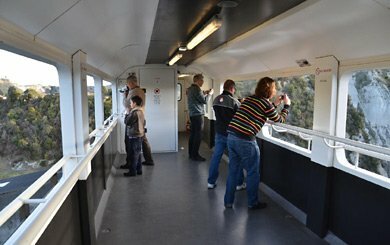 Open-air viewing platform: At one end of the train is a large open-air viewing platform, ideal for seeing and photographing the scenery, with no glass in between you and it. Children must be accompanied. Make a seating request: Seats are not allocated at booking, but on departure. 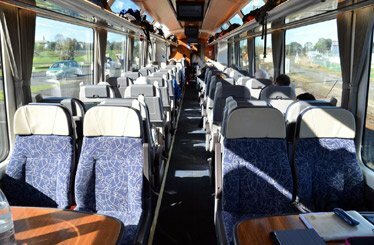 If you book by phone (or book online and then call Kiwi Rail's freephone number when you get to NZ at least the day before travel, quoting your booking reference) you can make a seating request. Seats on the right-hand side of the train going to Greymouth probably get the best views, or the left-hand side returning to Christchurch. Keen photographers could also request seats close to the viewing platform. Families or small groups may prefer a bay of 4 seats around a table to unidirectional seats. Requests can't be guaranteed, of course, but it doesn't hurt to ask! You should check in at least 20 minutes before departure at Christchurch's passenger railway station. This small modern rail terminal opened in 1993 in the suburb of Addington, about 3 km (1.5 miles) southwest of Christchurch city centre. You check-in at the desks in the main entrance hall, where you are allocated your seat numbers. Heavy baggage must be checked in to the baggage car. The station stands in the middle of an unremarkable industrial estate, but this whole area was once the massive Addington railway works where many of New Zealand Railways' locomotives and rolling stock were made. There's little left to show for it now! Christchurch's original railway station was located on Moorhouse Avenue immediately to the south of the city centre. Until the recent earthquake, the old station building, completed in 1960 to a design first published in 1938, still existed and was being used as the 'Science Alive' entertainment centre. It's now been demolished. The TranzAlpine leaves Christchurch at 08:15, and within ten minutes the Addington cement works and freight yards give way to small wooden suburban bungalows. Minutes later the train is crossing flat open farmland, doing 60mph across the Canterbury plain heading relentlessly towards the snow-capped Southern Alps on the horizon. 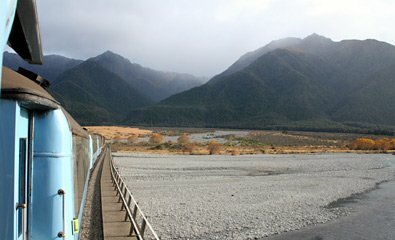 At around 09:20 the TranzAlpine starts its climb into the Southern Alps, with views of the stunning Waimakiriri River gorge to the right. As it climbs, the train crosses a series of steel girder bridges over deep gorges and through a series of short tunnels. The highest viaduct is the famous 'Staircase', 73 metres above the river. The scenery here is spectacular. By about 09.40, the train reaches a grassy plateau dotted with hills. Hills give way to more mountains, liberally hung with mist. 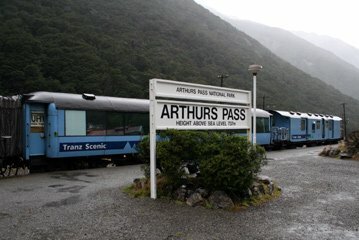 At 10:15 the TranzAlpine stops at Arthurs Pass station, surrounded by yet more mist-laden mountains, and there's time to get out , stretch your legs and take photographs. 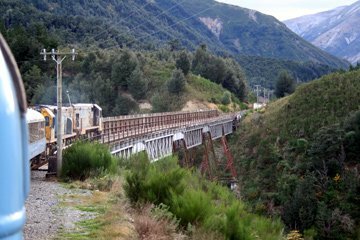 Almost immediately after leaving Arthurs Pass the train enters the Otira Tunnel. At 8.6 kilometres (5.3 miles) long, it's one of the longest tunnels in New Zealand. It was only completed in 1923, allowing direct train travel from east to west across the South Island. This section of line was once electrified, but now a door closes behind each train, allowing the train to act as a huge piston, forcing the diesel fumes out. Just the other side of the tunnel is Otira itself, where the TranzAlpine makes a very brief call. Otira was a railway town, running the railway that kept the coal flowing from the west coast coalfields to Christchurch and the rest of New Zealand. 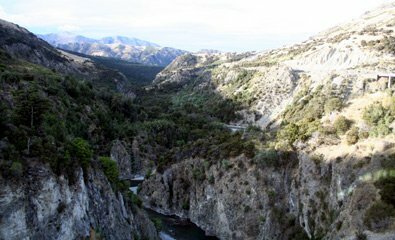 At around 12:00 the TranzAlpine passes the site of the Old Brunner Mine, just across the valley on the other side of the Grey River. This was the site of New Zealand's worst mining disaster in 1896. 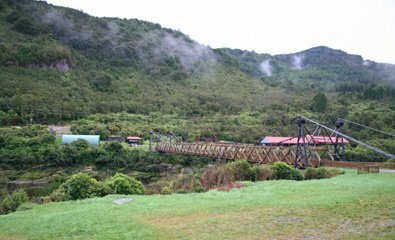 An ancient suspension bridge links the railway side of the river with the mine. The train passes Dobson, an old coal-mining town though all the mines are now closed. The TranzAlpine reaches Greymouth, a small town even by New Zealand standards, but it's the west coast's main centre. Even if it was warm and sunny in Christchurch, don't be surprised if you need your umbrella in Greymouth! Greymouth's wooden station building now houses an extensive gift shop and travel centre. Buses leave from just outside the station for destinations down the west coast, including Franz Josef Glacier. If you're returning to Christchurch the same day you have an hour to explore the town or find some food - try the Cafe 124, on the main road just along from the station. The town clock is on the river bank, originally housed in the tower of the impressive colonial post office. The post office and its tower were demolished as they were thought to be an earthquake risk, and the clock now stands in its own short wooden tower. Next to it on the river bank is a sign which warns against eating fish caught next to the nearby sewer outlet. Welcome to Greymouth! 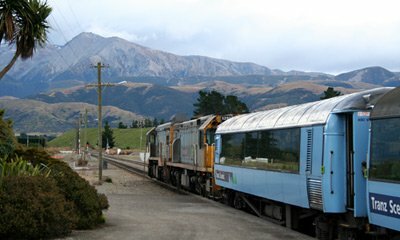 These photos show the old TranzAlpine train which used rebuilt 1950 coaches until 2012. You'll now see the same wonderful scenery, from a far nicer more modern train, see the new train photos above! Enjoying a Devonshire cream tea from the cafe-bar. Journey's end: The TranzAlpine arrived at Greymouth station on the rainy west coast of NZ's south island. 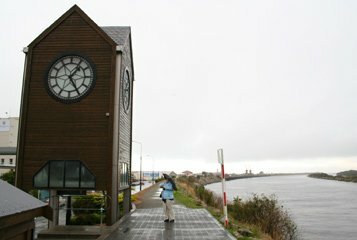 The town clock at Greymouth. The sign on the right warns you not to eat fish caught next to the sewer outlet! This video gives an excellent idea of just how good the TranzAlpine train ride can be! There is an excellent New Zealand Railpass giving unlimited travel on all Kiwi Rail Great Journeys passenger trains and the Inter-Island Ferry between Wellington and Picton. If you're going to travel on all 3 trains from Auckland to Wellington, across on the ferry and down to Christchurch and on to Greymouth, the 7-day pass will save money and give flexibility. Fixed pass = continuous unlimited travel, Freedom Pass = a set number of days unlimited travel which you can spend on the dates you want within an overall period. To buy online see www.kiwirailscenic.co.nz/scenic-rail-pass. Once you have a railpass, it's easy to make seat reservations to go with it simply by calling Kiwi Rail on 0800 TRAINS (0800 872 467) or from outside New Zealand, 00 64 4 495 0775. IMPORTANT UPDATE: Railpasses are temporarily unavailable, at least while the Coastal Pacific train is out of action. Custom-made train tour specialist Railbookers (www.railbookers.co.uk can arrange holidays around New Zealand using train travel rather than buses or flights. 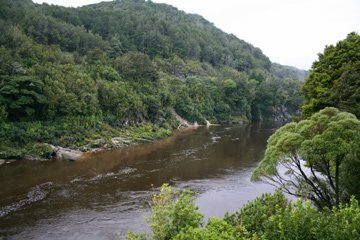 For example, they offer a 7-night trip from Auckland to Wellington on the Northern Explorer, Wellington to Picton on the inter-island ferry, Picton to Christchurch on the Coastal Pacific, and Christchurch to Greymouth on the 'TranzAlpine'. US call free 1-888-829-4775, www.railbookers.com. Canada call free 1-855-882-2910, www.railbookers.com. Australia call toll-free 1300 971 526, www.railbookers.com.au. Make sure you take a good guidebook. The Lonely Planets and Rough Guides are easily the best out there for the independent traveller. Both guides provide an excellent level of practical information and historical and cultural background. You won't regret buying one of these guides..! If you're on a tight budget, don't forget the hostels. For a dorm bed or an ultra-cheap private room in backpacker hostels in most European cities use www.hostelworld.com.